Grossmont and West Hills meet prior to the start of Monday’s tournament game at Kit Carson Park. ESCONDIDO (3-15-16) — In a result that will definitely raise some eyebrows the Grossmont Foothillers took on the West Hills Wolf Pack on Monday (Mar. 14) in Gold Bracket play of the Cougar Classic and came away with what many will say is one of the bigger upsets of the tournament with the 5-2 victory. Grossmont had the first at bat and was only able to garner one hit in the top of the first inning. So the Wolf Pack looked to get things going and it looked like they were in gear as they would push across a couple of runs to take the 2-0 lead. 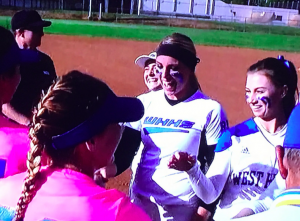 Leading off for West Hills was BROOKE ROBERTS who laced a single and would move up a base via a passed ball, SIERRA SCHLICHTING drew the base on balls, KENDALL MARINESI grounded out to second base for the first out. The very next batter, ALEX GUAY (1-3, 2 RBI, 2B) would work the count even 2-2 and take the next pitch and smash it for a two run double. The lead didn’t last long as the Foothillers were able to bounce back and score two of their own in the top of the second inning to knot the score at 2-2. Leadoff hitter MEGAN MALWITZ boomed a double to left center, TAYLOR BAEZ (1-3, R) drew a walk, KATIE APPENZELLER singled which scored Malwitz and MADDIE LINDSAY singled in Baez. West Hills in the bottom of the second inning had an opportunity as Marinesi blasted a double with one out. She would be stranded as the next two batters would be retired. Grossmont would end up taking the lead for good in the top of the third with a run as CHLOE CAMARERO (2-4, R, 2B) led off with a double and came around to score on a single by DESTINY BACON (3-4, R) to bring the score in favor of the Hillers 3-2. The Hillers scored a couple more times in the sixth inning as Allman drew the leadoff walk, Bacon singled, CARLY PEARSON (2-4) singled and SAMARIA ROOPE (1-4, 2 RBI) would rope a single that scored both ALEXIS COLLINS and Bacon to make the score 5-3. With the momentum in their favor, the Hiller faithful roared their cheers to a frenzy. Foothillers hurler Roope pretty much shut down the Wolf Pack offense as she limited them to 4 hits on the day in 6 innings while striking out 2 and walking only one. The victory for the Foothillers over West Hills was their first since they accomplished the league sweep back in 2011, which was also the last time they won a CIF San Diego Section crown. GRANITE HILLS 8, SAN MARCOS 3 – In Monday’s (Mar. 14) Silver Bracket action of the Cougar Classic the Granite Hills Eagles took on the San Marcos Knights and clawed their way to an 8-3 victory. The Eagles starter HALLE KYLER (0-1, 2 R) was able to retire the Knights in order in the top of the first inning. Leading off for the Eagles was speedster KAREN CREECH (2-2, R) who set the tone right away with her single, the next batter KAYLA MACK (2-2, 2 R, RBI) ripped a single moving Creech to second, KYLER drew a walk to load the bases. This was a golden opportunity for the Eagles to put some runs on the board. Opportunity taken advantage of as JESSIE LAPIERRE (1-2, RBI, R) smoked a single that scored Creech and moved the runners up, BRENDA RUSHING (2-3, 3 RBI, R, 3B) hammered another single that scored Mack. SYDNEY HUSE hit a ball to left field that was misplayed, allowing Kyler to score, and the other run would come on a sacrifice fly by MADISON CALDWELL which scored LaPierre to give the Eagles a 5-0 lead. Despite a threat in the top of the second from the Knights as they were able to put runners on via an error and a base hit, Kyler was able to retire the next three batters to put down the threat. The Eagles would deal the Knights another blow in the bottom of the second inning as Rushing would blast a triple that would score both Mack and Kyler to give the Eagles the 7-0 lead. San Marcos would finally get on the board and get to Kyler in the top of the third inning as they would put two runs on thanks to a couple of base hits to make the score 7-2. That was all they would muster in that inning. Granite Hills would answer with a run of their own in the bottom half of the inning due a double by Mack that would score HALEY BUDVARSON to make it 8-2. The Knights would tack on another in the fourth inning. On the day in the circle, Kyler would get the victory for the Eagles as she tossed all 5 innings, gave up 3 runs of which all were earned on 8 hits, fan 1 and walk 3. SANTANA 3, HILLTOP 1 – Santana took on the Hilltop Lancers in Cougar Classic play and were able to slay their way to a 3-1 victory in the Silver Bracket portion of the tournament on Monday (Mar. 14). Pitching was the name of the game for the Sultans as MADDY MENDEZ (1-3, RBI, 2B) completely stifled the Lancers on the day. She hurled 6 innings for the complete game, gave up 2 hits on the day and only one run. Santana mixed a little offense in the victory thanks to finally finding their bats but it wasn’t easy early on. The Sultans threatened in the bottom of the second as they were able to put runners on behind consecutive hits by JORDAN TEEGARDEN (2-3, RBI, R, HR) singling to right field and would also steal third and SHELBY HOLMQUIST (1-3) and ERICA REID who reached on an error. Unfortunately Teegarden would be picked off at third base for the second out of the inning. Hilltop would get out of the inning without any damage done. It wouldn’t be until the fourth inning that either team got on the board. The Lancers would be first to score thanks to a single and multiple wild pitches which would allow the runner to score giving them the 1-0 lead. Santana facing a deficit finally put together things. Leadoff hitter Teegarden gave the Sultan faithful something to cheer about when she took the 2-0 count and blasted the pitch high and deep over the centerfield fence for the solo jack and also tying the score 1-1. The homer was her first of the season and also first one over the fence in her high school career, she had an inside the park one last season. The next two Sultan batters would be retired giving the Lancers hope that would get out of the inning without any more damage done. So with two outs, ASHLEY MADRIGAL (1-2, R) stepped to the plate and was able to rip a single to right field. Next up was Mendez looking to help her own cause, she banged one deep to centerfield for a double that scored Madrigal. CASSIDY MATTHIE (RUN) came in as a courtesy runner for Mendez. Now with Santana leading 2-1, MACKENZIE BENNETT (2-3, 2B) hit the ball hard to the shortstop for the hit and moved Matthie to third base, Bennett stole second and Matthie came into score to give the Sultans some insurance as it was now 3-1. The two run lead would be all that Mendez needed as she went to work in the circle for the top of the fifth and was able to retire the side. She would do the same in the top of the sixth inning to end the game. VALHALLA 3, SAN PASQUAL 2 – Valhalla took on the San Pasqual Eagles in the Cougar Classic and were able to get the 3-2 victory in 10 innings in Monday’s (Mar. 14) International tie-breaker. Both teams had plenty of opportunities in the first couple of innings but neither could convert. However the Eagles in the fourth inning got on the board first as they pushed across a run to take the 1-0 lead. The one run lead would hold up for the Eagles until the sixth inning when the Norsemen pushed across the tying run. Leadoff hitter KENNEDY LABSHERE (2-4, RBI, R) singled but she would get out. RACHEL SHELLSTROM (2-3, R, 2B) ripped a double and moved to third on a passed ball. She would come in to score on a single by SAM GREEN to make it 1-1. The game would than go into International tie breaker rules where each team would get a runner at second base. San Pasqual would take advantage of a miscue by Valhalla to take a 2-1 lead. Things looked dim for the Norsemen but they would get back into the game as GIANNA PAAPE reached base on an error, KELLY OLSON stroked a one out single, BRANDI KOHEL would draw a walk. Paape would score to tie the game which would really set the dramatic ending. Labshere came to the plate and was able to get a hold of one for the game winning hit and also game winning RBI. Getting the victory for Valhalla was the workhorse LILY METSCH who tossed 10 innings for the complete game victory. In the victory she only gave up one earned run. PATRICK HENRY 9, STEELE CANYON 1 (5 inn.) – Patrick Henry took on the Steele Canyon Cougars in the Cougar Classic and were able to win in convincing fashion 9-1 in five innings. The Patriots pushed across two runs in the first inning as CRISTIONA CACCAMISE reached on a fielder’s choice, DANI ROMERO (3-3, 2 RBI, 2R, HR) singled, JOSIE GONZALEZ singled in Caccamise and ANYA VANDERSIP knocked in Romero with a single. Patrick Henry in the second inning would really burst the gates open as they put up a six spot to lead 9-0. SAVANNAH CHAPMAN (1-2, RBI, 2R, HR) started things by reaching on an error, ANDREA WRIGHT singled, MADISON JAMES reached on an error, HANNAH McEWEN would double in a couple of runs, CASSIE VAN TIL (RUN) would draw a walk, and Romero would blast a homerun. The Patriots would tack on their final run via solo homer by Chapman. It wouldn’t be until the fifth inning that the Cougars put up their only run against James who up to that point had not allowed many baserunners. JJ VENZOR (1-2, R) singled, SAM MILLER (2-2) singled, Venzor would move to third base and would score on a wild pitch by James. Unfortunately that would be all the Cougars would get as the next two batters would be retired via strikeout. James on the day for the Patriots would only allow five hits and strike out 8 Cougars in the shortened contest.